Well this year, as with other past several years I was planning on entering my Chow into the show. However, 2 weeks ago he got himself into a fight had several puncture wounds about the body, but a huge gash at the base of his ear. Well, now he has a bunch of scabs around his neck, so when time for them to detach, they will carry all that undercoat he has. Also the fight actually cause a good amount of hair around his neck to become matted at the time, so when I was trying to remove the mats ,a nice amount of undercoat came out. I have been preping his coat from August, by switching his diet to a home made meal which actually put coat on him, it blossomed for about 2 - 3 months then it started to plateau,...but coat came in slowly but surely. I was actually thick and without the assistance of Inflight this go around (so I can only imagine if I did). Well now like I said earlier all of that is gone. So seeing as to the dilemma, I decided to not enter him this year,...but to volunteer at the entry table for exhibitors. Well, now some how a lady heard that I was undecided as to what I was going to do, so she called me to work asking if I would be able to show her Shiloh Shepherd. She said that the dog had already won 5 Best in Shows in the states (NAKC), and she pitched her dog to me like the perfect salesman (in this case sales lady). So I was eager, but I played it cool and I told her that I'll think about it in a day or 2, I told her yes. Well with my promise that I had made with the club, I will have my brother assisting me as usual, so when its time for me to dash in the ring, he will man the fort until I am finished. I was really looking forward on seeing how this year goes as Krillan will be 10 this year and is still in good condition. But I guess everything happens for a reason. Well it'll be interesting to see how thing turns out this year. 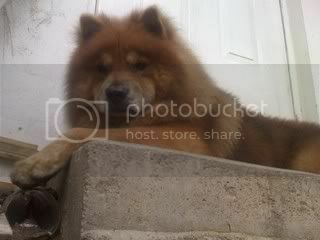 Do you own your Chow Chow or does your Chows own you. Who serves who? many thanks for the update and learning about your intentions on the forthcoming show! Keep us informed and you know what? Piictures are always welcome on this forum! Yes he's 10,....time just fly by. It was just like yesterday when I first got him. I was 13 at the time. Well i most certainly will keep you informed and i most definitely will have as much pictures as possible.